We did, although the days leading up to it were pretty busy. 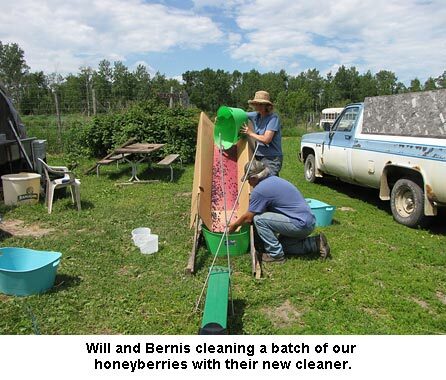 On Monday, Will and I traveled to Bagley, Minnesota, to visit Jim and Bernis at their farm, Honeyberry USA. They raise and sell many varieties of berries, chiefly many kinds of honeyberries along with hardy cherries and others, coupled with their U-Pick farm. Will and I picked while we visited with Bernis as she escorted pickers to their own sections of the netted bushes. 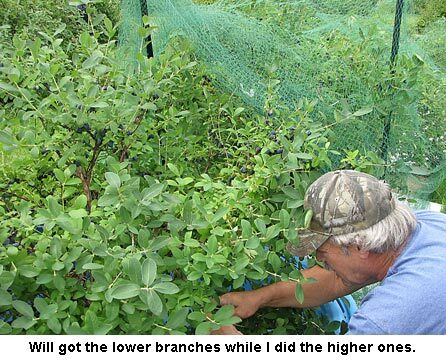 Like us, they have hungry cedar waxwings and have to net to get berries for themselves. Without nets, the birds get most of the berries. We also got to sample many different varieties and we chose our very favorites so next spring we could buy a few new bushes to add to our growing orchard. We ended up with almost 30 pounds of berries! Guess who gets to make jam now? I did five batches yesterday, netting 22 half-pints. 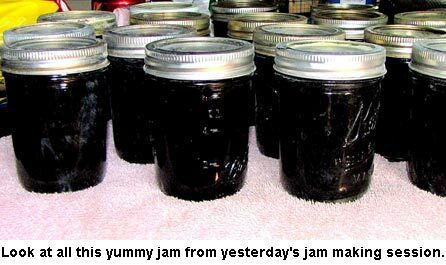 But today the temperatures shot up to the high 80s and I’m not doing jam until evening. The berries are in the fridges and seem to be holding well. But I have to keep at it so they don’t start to spoil. We’d like to add Kauai honeyberries to our orchard but have heard they won’t be available until 2019…. Peel and core your apples and then process in a blender till smooth or cook the apples down in a crock pot or stainless steel pot. Once the apples are cooked and have reached a butter consistency (creamy) add the pumpkin powder, sugar, and pie spice. Stir in ingredients and cook for another 30 minutes. Taste the butter. If you think it needs more pumpkin flavor add another teaspoon, but it was really good after the 2 1/2 tablespoons. The flavor had that great pumpkin pie richness. Add your lemon juice just to preserve the color and ladle into your sterlized jars. Remove air bubbles, fill to 1/4″ headspace and wipe rims. Add hot lids/rings and process in the water bath for 10 minutes at a full rolling boil. Nice idea on the berry cleaner. That is what make you good homesteaders. Always thinking. 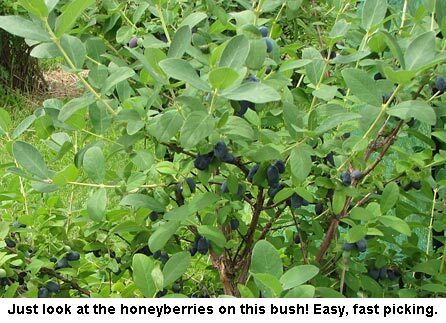 What variety of the honeyberry are you looking to buy? They look and taste fabulous!